Why does boiling water in the microwave make a cup of tea go weird? When I boil water in the kettle, it makes a nice cup of tea. Sometimes I need to use a microwave because a kettle isn't available. I boil the water in the mug and it looks pretty normal, but when I drop in the teabag the water froths up and looks foamy. I don't see what the chemical difference is here, so I assume it must be some physical difference. I have noticed this with multiple types of tea and multiple microwaves, the results being consistent so it's not just a weird microwave or something like that. What is the reaction here and how/why does it occur? 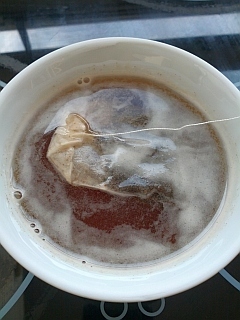 Here is a photo of the 'fizzy' looking tea just after dunking in the teabag. I doubt that it's superheating, as I understand superheating is a rather violent phenomenon. The most likely explanation is dissolved gases; gas solubility in water decreases with temperature. The kettle boiling process is very turbulent and so can release all the dissolved gases, resulting in pure hot water. The microwaved water is heated in a very gentle way, and so the gases do not yet have a chance to escape from the surface... not until they can start nucleating on your tea bag. A common problem with microwave is that you lack control of the temperature of the water. Second problem is that the water is heated from the top and the sides of the mug mostly. Result is, that the content of the mug is not really boiling hot everywhere, altogether (after mixing) it is well below 100 °C A side effect from this is, that the water is not dearated like it is when You boil it on a hot plate. So: You have some water close to 100 C at the surface and colder (containing air) water below. When You dip in the bag, all that mixes, the air bubbles out. I think you are superheating the water and you provide nucleation sites (by means of the tea bag) so it starts to boil. Another problem here could be the temperature of the water. If you pour boiling water into a cold mug, then the temperature of the water will drop due to heat transfer to the mug. Also as you are pouring some of the water turns to steam. If you boil the water in the mug, then the water in the mug is at the boiling point. Hotter seeping temperatures tend to bring out bitter flavors in the tea. Not the answer you're looking for? Browse other questions tagged thermodynamics water or ask your own question. Why when I put a teabag into microwaved water does the water fizz? Would a Cup of Tea Be Hotter If you Add the Milk Before or After Boiling Water? Is tea weaker if you make it in a half full cup of water? How does the hot cup of tea cool down? Why water boiling time depends linearly on water volume? Why does water make a paper type substances weak? Does salt affect the boiling time of water? When boiling water, why does the water level decrease? Why do tea bags sometimes float and sometimes sink?